Which is “Better:” Six Month Braces or Invisalign? Among adults, when they are considering having braces done to straighten their teeth, one of the first options that always comes to mind is InvisalignTM, because what adults usually want is for no one to actually know that they have braces! With adult orthodontics becoming more popular and mainstream, largely thanks to marketing by Invisalign, it’s not quite as critical as it used to be that the braces be invisible, but it’s still preferable. The other thing that adults want with their braces, is that they do NOT want to have them on for 2-3 years. In fact, most of the Six Month Braces Patients that we see have had 1 or more consultations with an orthodontist already, and they just refused to be in braces that long. Six Month Braces may not be quite as invisible as Invisalign, but with clear brackets (either plastic or ceramic) and wires that have a tooth-colored coating, they’re pretty close. Here’s a before/during photo set of one of our current patients, so you can see how dramatic a change we can create in a short period of time. 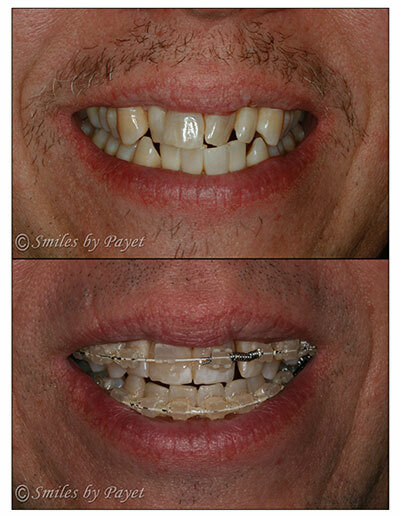 Jim is in his 40’s and had long wanted straighter teeth. We placed the brackets in April 2010, which means that he has had his braces on for about 6.5 months, and he’s quite close to being finished. He’ll probably still have them on for Thanksgiving, but he’ll have them off in December so he can have a straight, white smile as a Christmas Present.